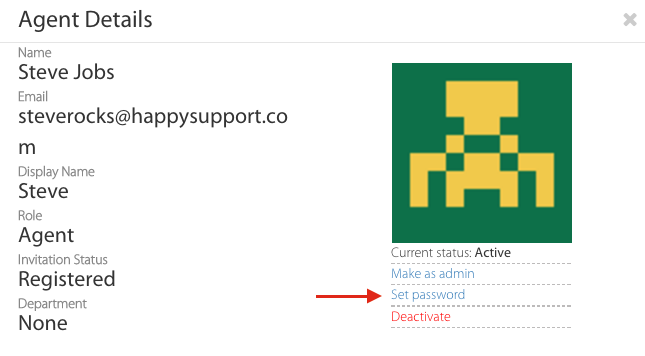 Adding new agents and deactivating agents can be done only by Admins of HappyFox Chat. Any number of agents can be added to your HappyFox Chat account. The subscription fee is per agent. 1. 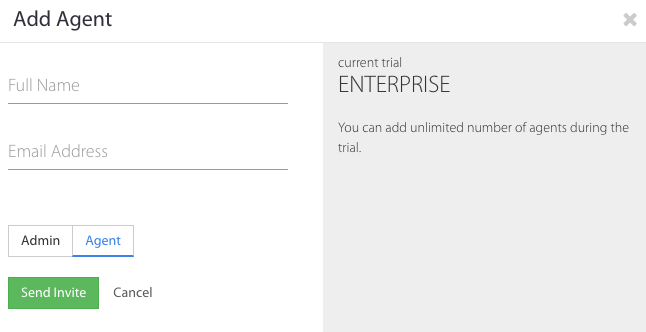 Admin users can start adding new agents from the Agents section. 2. 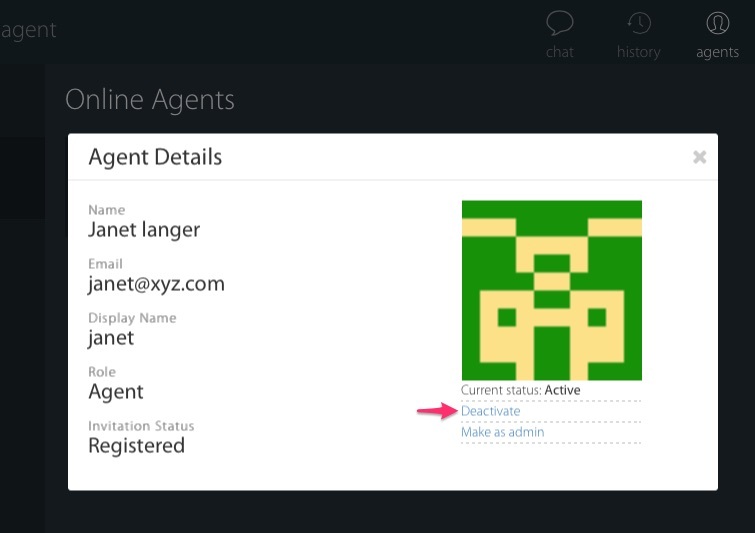 To add a new agent, click on the Add Agent tile. 3. Clicking it will open a pop-up, in which you can to enter the details of the new agent. You can set their privilege as Admin/Agent. Once done, click "Send Invite" button. 4. 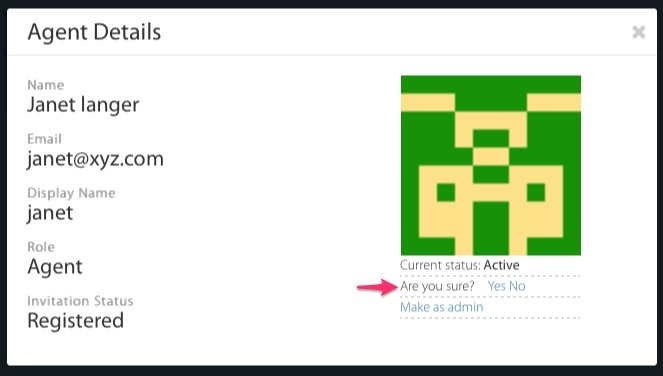 An invite email will be sent to agent's email id, with the status 'Invited' indicated in the respective agent's tile. How to resend/delete agent invitation? 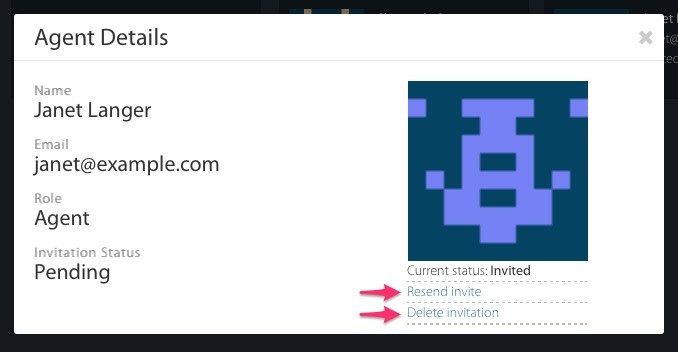 To resend the invite/delete the agent invitation, click on the particular agent's tile and it will open a pop-up. On the bottom right on the pop-up, you will see these options. 1. When the agent accepts the invite from the email and logs into HappyFox Chat, she/he'll be able to take up new chat requests. The agent's status will be changed to 'Available/Online' in the respective agent's tile. 2. Admins have an option to set passwords for agents who accepted the invitation. Admins cannot set password for other admins. How to deactivate an agent/admin? 1. To deactivate an agent, go the "Agents" tab > Go to "All agents" (left pane) and click on the agent name who should be deactivated. On the resultant pop-up, click on "Deactivate" option. 2. On clicking "Deactivate", you will be prompted with "Are you sure? (Yes/No)" message. Clicking "Yes", will proceed to deactivate the agent and choosing "No" will abort the action. 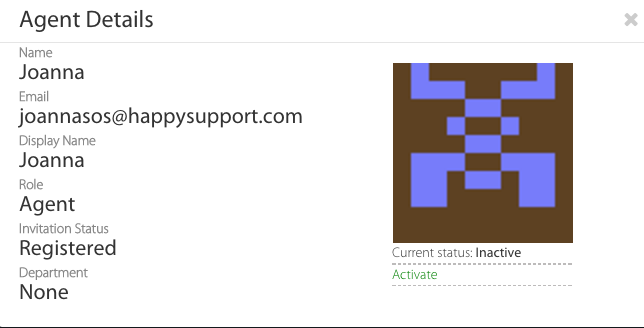 Note: Account Owner (who signed up for HappyFox Chat account) cannot be deactivated. 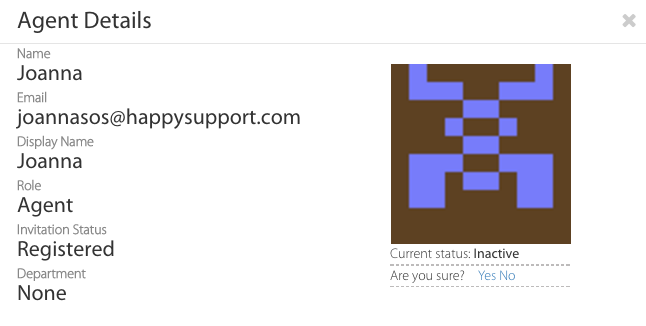 You need to email us at support@happyfoxchat.com. Go the "Agents" tab > Go to "All agents" (left pane) and click on the agent name who should be reactivated. On the resultant pop-up, click on "Activate" option. Confirm by clicking Yes/No and proceed. Option to completely delete or remove an agent from the HappyFox Chat is not available. You can only deactivate the agent and the particular will not able to access the account.